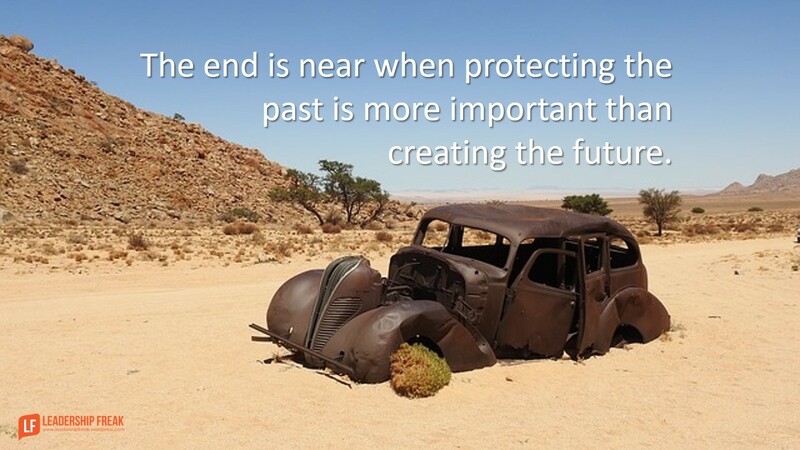 The end is near when protecting the past is more important than creating the future. #3. What do you need to get to your comfort number? Be as specific as possible. Focus on what they need to hear, not what you need to say. Note: These questions assume leaders have been exploring an opportunity and have already committed to do something, but they’re reluctant to move forward. Convince reluctant leaders to move forward by telling the story of an organization that’s doing what they’re considering. You’ve been talking for months about things others have been doing for years. How might you instill confidence by learning from others? Who will champion the cause? When will you evaluate the pilot? The greatest value of big goals is they embolden small steps. Decide where you want to be in ten years. Make it about serving others. Big goals capture the imagination, elevate self-worth, inspire courage, and set direction. Develop an imperfect solution. 70% is perfect enough. If the stakes are high, go with 80% perfect. Which of these strategies might work best in your organization? What convinces reluctant leaders to move forward? Which of these strategies might work best in your organization?#4. Set a big goal. Take a small step: This has worked for me over the years, take what you can accomplish and gradually add more to the task, to one’s career, sometimes too much of the pie can be out of reach, accept a piece and build bigger pieces. The cliche’ Rome wasn’t built in a day” jumps out, neither to setting goals that are unattainable. Be realistic in your desires, what are the limitations? where do they exist? Are we wasting time and money on something not reachable? What convinces reluctant leaders to move forward? Believing in yourself and others, if you have doubts in one’s capabilities you will shy away, develop stamina and prepare yourself for uphill challenges and downhill accelerations that you can control, If you can’t control the situation you may be in the wrong position or just need some guidance. Don’t be afraid to seek help! I particularly enjoyed your addition of belief in yourself and others. Very powerful. I think we have to trust that we can find solutions as we move forward. For me it was simple, the job Superintendent stated either I run the crew or you all go home and don’t get paid! I never looked back, we all received our pay! I was 19. Nice. And I am reminded of Dilbert, “Change is good. You go first.” – There are simply so many incremental small steps forward that can be taken. So many new perspectives that can be observed. SO much ownership to generate! Apologies in advance but, completely off subject…What’s the story with the car in the image above! 🙂 How did it get there? It looks like a get-away attempt gone wrong! Thanks Dianna. Good question. I have no idea, but a get-away attempt sounds like a good story. Just an fyi. I choose a quote and then go to pixabay to find an image. I choose the first image that makes me feel something. It all happens very quickly. Show progress as a win. Show the status quo as losing. Many reluctant leaders are reluctant because they averse to losing/failing. You need to make the risks involved in progress appear smaller than the risk of doing nothing. I have facilitated a number of change efforts. I rely on Dr. Ackoff’s Interactive Planning (IP) method to facilitate change. Since none of us can predict what tomorrow will bring, IP focuses on figuring out where one would want to “Ideally” be today and then planning backward to bring it about. IP is a highly participatory process that allows those involved to gain a sense of being in control of creating their future NOW, which often leads to very innovative outcomes.